As previously discussed, the phrase “Mail-Order Bride” wasn’t common in the American West in the mid to late 19th century. But readers of romantic fiction within the mail-order bride trope certainly think so… because our beloved fiction uses the term readily. But that’s perfectly OK. After all, fiction is fiction, and its purpose is to entertain. If Mail-Order Brides weren’t referred to as such–yet–when did the term become common and popular… in real-life accurate history? Now–to be completely fair, the author of that statement did say “in the New York Times“, thereby indicating she wasn’t addressing any other newspapers or circulars or sources. But yeah, the term showed up well before 1929, even if the Times didn’t keep up with the new jargon. 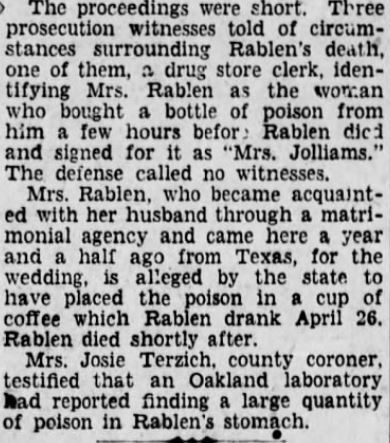 The story of Eva Rablen poisoning her husband of seventeen months with rat poison in his coffee while he waited for her in the car outside while she enjoyed herself at a community dance (he was hard of hearing and believed he could not dance), was quite the sensational bit of news. Papers across the nation carried the terrible story. 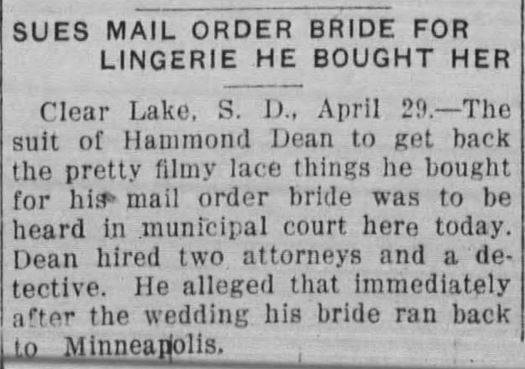 This obscene true-to-history tale of murder within a mail-order bride / “correspondence courtship” marriage definitely qualifies as an epic fail… and perhaps the worst of all scams perpetrated. LARGE headline in The Scranton Republican, page 2 on Wednesday, May 15, 1929. For this early in newspaper history, a title larger than 2 to 3 times the height of the font within the article was extremely uncommon. This image allows for comparison of the subheading (below) and article, which follows, with striking difference in size of font. Note that the article header scans the full sheet of newsprint (from cut left edge to the “spine” / fold), well beyond the brief article containing updates on the case. 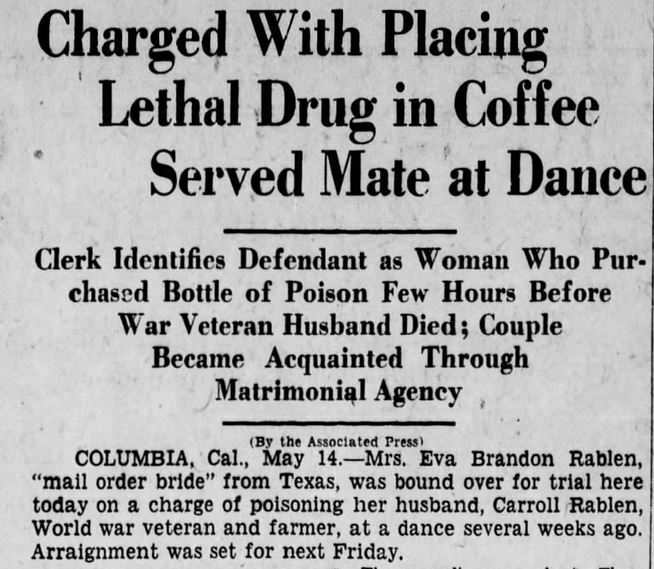 Note the quotation marks around “Mail Order Bride” in the header, indicating either A) relatively new or unknown term or B) maybe a less-than politically correct or slang reference. The article continues, below. 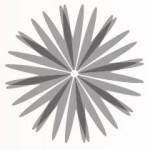 In the image above, note that the article itself takes up very little space. The Scranton Republican, 15 May, 1929. Other newspaper articles covering both happy and sad occasions of mail-order bride arrangements appeared far earlier than 1929. 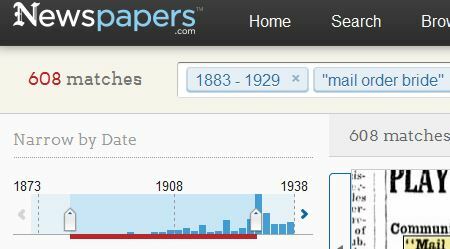 This screen shot shows my search for the phrase “mail order bride” (with or without the dash) in all newspapers available within my subscription on newspapers.com. You may note references prior to 1908 were very few and far between (when searching from 1883 to 1929 and Eva Rablen’s murderous attack–note the blue spike in 1929 where the 2nd white arrow-topped marker points to 1929). 29 April, 1916. The Twin-City Daily Sentinel. Winston-Salem, North Carolina. 23 May, 1906. 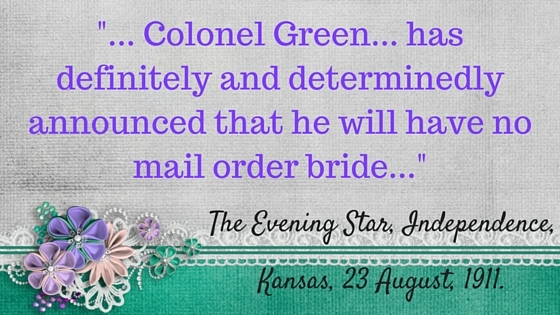 The Evening Star, Independence, Kansas. 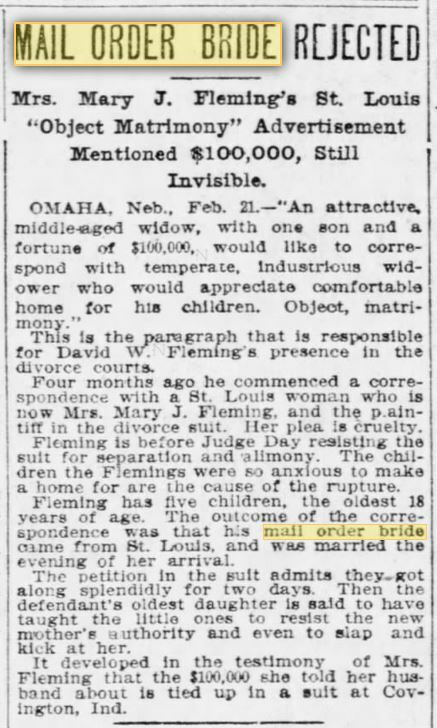 Published on 22 February, 1903, in the St. Louis Post-Dispatch. 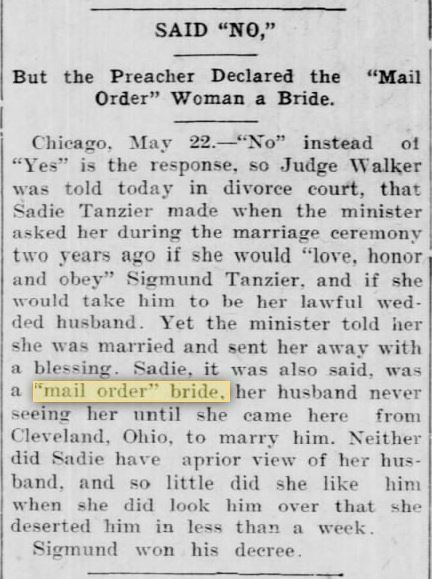 And, as 1903 is solidly within the 20th Century (and though I have no way of knowing if other credible sources provide documentation that the term “mail-order bride” [with or without the dash] was used before the turn of the century, it’s the best I can do). 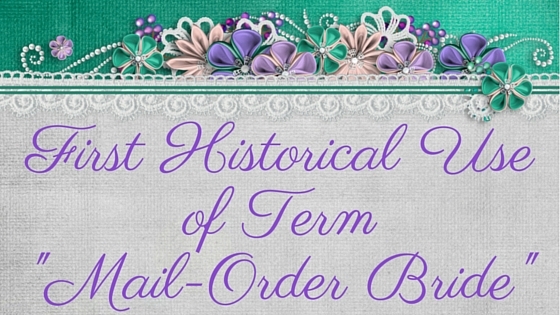 This earliest currently available reference to “Mail-Order Bride” (with or without capitalization, with or without dash) backs up my earlier assertions that the phrase was unfamiliar in the days following the Great War (War Between the States, the War of Northern Aggression, The Civil War), through the ever-popular 1880’s and 1890’s (I assume). Cool, eh? I personally enjoy researching random tidbits such as the origin and popularity of terms and phrases to bring the maximum amount of historical accuracy to my fiction. Even if it is merely for enjoyment. Up next! 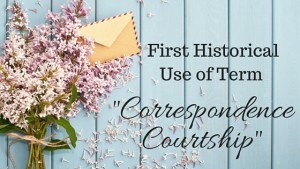 (4-3-16) First Historical Use of term “Correspondence Courtship” because interestingly enough, newspaper reporters began referring to what you and I would call “mail-order brides” and their resultant marriages as “Correspondence Courtships”. What a truly American Victorian phrase. Join me in a short 3 days for this next exploration of the late Victorian-era language etymology (a chronological account of the birth and development of a particular word of element of a word, often delineating its spread from one language to another and its evolving changes in form and meaning. 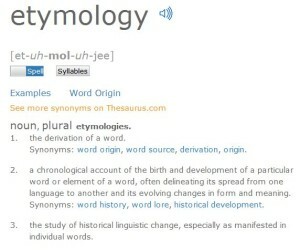 Synonyms: word history, word lore, historical development). I love seeing all the articles in your post. In my research, I have noted Merriam-Webster Dictionary credits the first appearance in print (not specifically newspapers) as 1867. I’d infer this means pamphlets or flyers distributed privately or in means other than a newspaper. Excellent source–the Miriam-Webster Dictionary. And I’m fascinated to find a reference as early as 1867! I’m so glad you stopped by and shared. (And glad to find I’m not alone in my search for “firsts” with MOB names, details, and history).